The Cowan Report: Why Did H&F Council Openly Mislead Viewers Of The BBC’s Politics Show? Why Did H&F Council Openly Mislead Viewers Of The BBC’s Politics Show? Last June the BBC’s Politics Show decided to investigate H&F Conservatives' highly controversial plans to knock down at least 3500 residents’ homes and force many people out of the borough. The Conservative Administration refused to send any politician instead sending Mr. Nick Johnson, who is an official. It now turns out that much of what Nick Johnson told the viewers of that programme is not true and grossly misrepresents the Conservative Administration’s actual position. How could that happen? I agreed to appear on the Politics Show. However, Cllr. Stephen Greenhalgh, the Conservative Leader of the Council was apparently out of the country. It would therefore have been normal practice to send Cllr. Lucy Ivimy (Con), H&F’s Cabinet Member for Housing. They could have even sent Cllr. Mark Loveday (Con), H&F’s Cabinet Member for Strategy as he is actually the politician who has been leading on many of the council estate sell-off negotiations with property speculators both here in London and on excursions to the French Riviera. Instead, Nick Johnson was asked to enter the fray and was put up to debate this most political of issues with me. Nick Johnson is the retired Chief Executive of Bexley Council and has been working as the consultant Chief Executive of H&F Council’s wholly-owned “arms length” (ALMO) council house managing agents - H&F Homes. Having since spoken to the chair of H&F Homes and many of its board members, it has become apparent that Nick Johnson did not seek the Board’s permission to appear on that programme. Instead, he only “informed” the chair of H&F Homes that he would be appearing on the Politics Show hours before he actually did so. I understand that many on the Board are furious about this. It also says much about how that Board is viewed that its members could have been treated so casually on a matter of such controversy. Once on the programme and under questioning from the BBC’s Tim Donovan, Nick Johnson gave its viewers a number of assurances used to specifically rebut the evidence that the Conservative Administration is against social rented housing and is proposing to knock much of it down. For example, Nick Johnson asserted “between now and May 2010 we will be building 870 new socially rented homes”. It was an interesting statement. Firstly, what would the journalist or the BBC’s viewers believe Nick Johnson had meant by his use of the word “we” in this context? Secondly, is that statement true? Nick Johnson’s comment could not possibly apply to H&F Homes as not only is it not legally allowed to build homes but at the time Nick Johnson appeared on the programme, this company was set to be wound up on the 31st March 2010 (the Conservatives have now extended its lifespan by just one year). H&F Council is also forbidden from house building so the statement does not apply to that public body either. In fact, Council administrations facilitate the building of new homes by putting the deals together with Registered Social Landlords (RSLs), the Housing Corporation and others. It is then up to councillors to decide whether or not to grant planning permission. This activity is one of the main dividing lines between the political parties in London. The Conservatives, on the whole, do not facilitate the building of much (if any) social rented housing, whereas Labour does tend to build it into new mixed-tenure developments. Indeed, at one point, we (the last Labour Administration) arranged for the building of more affordable homes than the rest of London put together using this strategy. So, if it wasn’t H&F Homes or H&F Council who was Nick Johnson defending during the interview? It seems obvious, given the setting and the line of questions he was responding to, that most viewers would quite resonably believe Nick Johnson was talking about the current Conservative Administration. Officers are forbiden by law from engaging in party politics. Was this therefore a clumsy mistake which he made throughout the programme? Or, did the Conservative Administration intend this to happen? And, why did H&F Homes' Directors play no part in deciding whether their Chief Executive should be allowed to do this? On the 30th June the residents that have formed the Hands Off Our Queen Caroline Homes action group sent a letter seeking to get to the bottom of all this and asking for the substance behind many of Nick Johnson’s comments. The reply they received was astonishing. It failed to answer their queries and instead they were invited for a cosy chat. They told me they found this patronising in the extreme. They wanted clear answers in writing. They continued to demand a satisfactory response but to no avail. In view of this I wrote to Mr. Geoff Alltimes, the Chief Executive of the London Borough of Hammersmith and Fulham on the 10th October 2009. I sought a response to the action group’s unanswered questions and raised a few of my own. "the date they went to the Planning Applications Committee"
"the name of the developer"
I wrote to Geoff Alltimes again on 30th October to insist he responded to all my questions. He wrote back on 6th November with a little more information. As expected, it turns out that Nick Johnson’s statement about the “870 new socially rented homes” was not true. Of the “870 affordable rented homes” quoted by Nick Johnson, 723 had the deals put together and planning permission granted by the last Labour Administration between 2001 to 2006 – nearly all opposed by the Conservatives at the time. A further 104 were imposed on Hammersmith and Fulham by Mayor Ken Livingstone between 2006 to 2008 - often after a protracted fight with H&F Council’s Conservative Administration. The rest were part of packages forced onto the Administration by the government and its agencies. In conclusion these were not being built by H&F Homes, H&F Council and nearly all were actually opposed by the Conservatives. 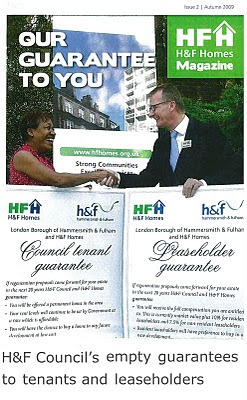 Please let me know who asked Mr. Johnson to appear on the programme and who in H&F Council signed it off. Declined to respond. I would like clarification of the legal guarantees secured between H&F Homes and H&F Council about the security of residents’ homes. Declined to respond. Nick Johnson said the “number of social rented won’t change” from its current level. This conflicts with what the politicians in charge of our borough are prepared to commit to. Please therefore tell me the basis for which Mr. Johnson to make such clear guarantees. Declined to respond. Nick Johnson told the BBC that “People will not be asked to go out of the borough”. However, I am aware that officers have already offered some residents of the affected estates the opportunity to move out of the borough. Nick Johnson’s statement therefore seems to be in conflict with what officers working for H&F Homes are actually currently doing. Please let me know why Nick Johnson was authorised to make such an assertion. Declined to respond. Nick Johnson used the word guarantee frequently throughout. He said “We are giving guarantees to people…” I am particularly keen to understand the legal nature around the guarantees Mr Johnson gave. It seems that he was in no position to issue any such commitments. Declined to respond. My request for this information is not unreasonable. I am asking on behalf of my worried constituents. So it is telling that this borough’s most senior official is refusing to provide answers to these concerns. Meanwhile, H&F Conservatives, who are normally more than keen to engage with the media, seem to be running scared when it comes to their demolition plans and have refused interviews with a host of press including the Guardian, the BBC and even a student journalist. It is apparent that our Conservative councillors are not confident they could deal with the most basic lines of journalistic enquiry. This video made by the Guardian provides added insight. It is highly dubious for this Conservative Administration to use publicly funded council officers and consultants to front such a controversial political policy. Nick Johnson is still being wheeled out (see pic) to tell residents pretty much what he told the BBC. Vast sums of public money are being spent on glossy literature offering extremely vague “guarantees” – which do not ensure that residents will be offered a new home they will want, will be able to afford (Cllr. Stephen Greenhalgh is arguing for a move to market rents), or that is on the same estate they were removed from. I will continue to seek this information on behalf of the thousands of residents who are deeply anxious about the Conservatives' talks to demolish their homes. Sooner or later we will get the answers my constituents require. It will be better for all if that happens soon.